LAKE SUCCESS, N.Y., February 8, 2010 - Canon U.S.A., Inc., a leader in digital imaging, today introduced the new flagship model for the Company's highly popular Rebel DSLR line: the Canon EOS Rebel T2i Digital SLR camera. Today's photo enthusiast is looking for a camera that will grow with them as they learn, and that is a perfect description of the new EOS Rebel T2i Digital SLR camera. Retaining all of the traditional characteristics that have made the EOS Rebel series beloved by entry-level photographers and an industry best-seller, the new Rebel T2i succeeds in bridging the gap between an entry-level camera and a true pro-sumer camera. The Rebel T2i Digital SLR camera includes a variety of new features for photographic assignments as varied as grabbing that action shot from the sidelines or creating memorable family portraits, including: 3.7 fps shooting, an ISO range of 100-6400 (expandable to 12,800), a 63-zone Dual Layer Metering System, and Canon's DIGIC 4 Imaging Processor. There are some moments in our lives where video helps capture the moment better than a still image, and the Rebel T2i offers the best of both worlds with Full HD 1080p video as well as 18-megapixel still images. The Rebel T2i DSLR continues Canon's industry-leading trend in Full HD DSLR video capture with manual exposure control, selectable frame rates and a new external microphone input. There is also a new feature for standard definition recording, Movie Crop, which provides an approximate 7x additional zoom with no loss of image quality when shooting SD quality video. "There is no question that HD video is the biggest trend in DSLR technology and because of this we are seeing the creativity of still photographers transferring to the moving image. Still photographers are using the various lenses and accessories they are already familiar with to create amazing video footage," stated Yuichi Ishizuka, executive vice president and general manager, Consumer Imaging Group, Canon U.S.A. "Taking that HD video quality and putting it in the hands of entry-level photographers with cameras like our new EOS Rebel T2i, we are seeing a new generation of creative digital artists emerge." Canon's EOS HD video capture has helped spark a major movement in digital imaging, empowering still photographers with the ability to experiment, learn and capture stunning high-definition video through a variety of creative lenses. Continuing this imaging revolution, the new EOS Rebel T2i puts entry-level photographers on the frontline equipped with all the latest EOS HD video features including full HD video at 1920x1080 resolution, selectable frame rates, full manual exposure control and the visual options of interchangeable lenses. Manual video exposure control provides novice filmmakers with the image control they are accustomed to in a still camera, all while shooting professional-level cinematic video. Professional photographers utilize creative lighting, adjustable depth-of-field and a variety of lenses to create powerful still images and video footage, and these are exactly the tools that the new Rebel T2i gives to budding photo and video enthusiasts. Adding a new professional-level feature for EOS cameras, the Rebel T2i includes an Auto ISO function that works in all Creative Zone exposure modes including Manual where users can set a limit to the highest ISO the camera will use, enabling them to retain the lighting and look they desire for a scene. By setting an Auto ISO range, videographers can retain dark shadow areas and avoid blowing out highlight areas in a scene while still retaining the benefit of automatic ISO adjustments. The Rebel T2i DSLR captures video in both NTSC (National Television System Committee) and PAL (Phase Altering Line) standards at selectable frame rates including Full HD 1920 x 1080 at 30 (29.97), 25 or 24 (23.976) fps, and HD 1280 x 720 or Standard Definition 640 x 480 quality video, at 60 (59.94) or 50 fps. For easier video recording operation and familiar functionality for beginners, the Rebel T2i's autofocus can be operated before or during video recording by pressing the shutter button half-way down in video mode. Another feature debuting in the Rebel T2i is Canon's new Movie Crop mode, where the user can achieve 7x magnification when shooting SD video for a significantly increased "telephoto" effect. Unlike the digital zoom feature found in many compact digital cameras, Canon's new Movie Crop mode actually crops the image directly from the CMOS sensor at full SD resolution to preserve maximum image quality and provide additional zoom power. The new Movie Crop feature is especially helpful for achieving extra full resolution zoom power when filming youth sports, such as a child running to the furthest end of a field. For better sound quality when shooting video, the Rebel T2i DSLR includes an external stereo microphone jack, a first for an EOS Rebel model, in addition to its built-in monaural microphone. These audio and video features supplement a tremendous range of additional must-have video features in an entry-level Digital SLR camera. For enhanced viewing pleasure and easy video sharing at home, the HDMI video-out capability of the Rebel T2i DSLR includes a new Consumer Electronics Control (CEC) compatibility which allows users to play back still or video files on a CEC-compliant HDTV, using the TV remote to control the camera when connected via HDMI interface. The EOS Rebel T2i DSLR features a newly developed 18-million-pixel Canon CMOS imaging sensor providing outstanding resolution and light sensitivity for amazing poster-sized prints with fine detail and stunning color. The camera exhibits exceptional low-noise performance incorporating many of the same technologies used to reduce noise in professional cameras such as the EOS 7D. The Rebel T2i camera's basic ISO range is an amazing 100~6400, and via a Custom Function, it can be extended to ISO 12,800. The outstanding ISO range combined with its noise reduction technology allows the Rebel T2i to capture outstanding low-light pictures at events such as candlelit birthday celebrations or recitals where flash photography may be prohibited. The camera provides 3.7 fps continuous shooting for still photos, making it the fastest shooting Rebel model to date and enabling users to capture that great image of a little leaguer's first swing. The camera features Canon's proprietary iFCL 63-zone dual-layer metering system offering intelligent Evaluative metering with much finer segmentation than any previous EOS Rebel model. The new Rebel T2i also has an expanded ± 5 EV exposure compensation range allowing for much more versatility when shooting in extremely bright or dark environments; or when shooting HDR (high dynamic range) images. The Rebel T2i DSLR includes a number of professional-level user-selectable Canon image processing features to enhance the image quality of in-camera JPEG files, and to tag RAW images for processing later through Canon's Digital Photo Professional software (included with the camera). These features include Canon's Auto Lighting Optimizer to enhance shadow detail and add contrast to "flat" scenes, Highlight Tone Priority adding up to one stop of detail in bright highlight areas, Peripheral Illumination Correction for automatic correction of vignetting, High ISO Noise Reduction with four user-selectable settings, and Long Exposure Noise Reduction applied to exposures one second or longer. These Canon image enhancements provide new photographers with professional quality automatic image correction on JPEG files right out of the camera. The EOS Rebel T2i digital camera includes a new enhanced 3-inch LCD monitor featuring 1.04 million dots with a wide 3:2 aspect ratio, wider than previous EOS models. 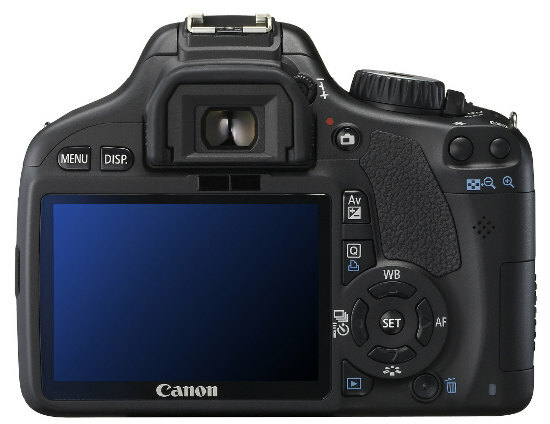 The Rebel T2i camera's LCD monitor can display a full-screen video image utilizing the entire screen during playback. For maximum storage capacity the new EOS Rebel T2i Digital SLR camera is the first EOS model to support SDXC memory cards. With all the new and exciting features of the EOS Rebel T2i, the Rebel series continues to provide great Canon features such as Live View, a built-in pop-up flash, and the EOS integrated cleaning system, as well as compatibility with Canon EX-series Speedlites and Canon EF and EF-S lenses allowing users to fully explore multiple creative photographic possibilities. The new EOS Rebel T2i Digital SLR camera is also compatible with Canon's new BG-E8 battery grip and new RC-6 wireless remote control for both still images and video capture. 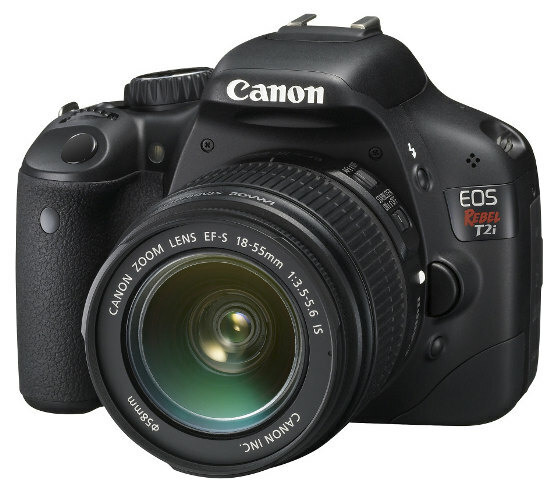 The Canon EOS Rebel T2i Digital SLR camera is scheduled to be delivered to U.S. dealers in early March, and will be sold in a body-only configuration at an estimated retail price of $799.99. It will also be offered in a kit version with Canon's EF-S 18-55mm f/3.5-5.6 IS zoom lens at an estimated retail price of $899.99. Specifications, availability, and pricing are subject to change without notice. HDMI, HDMI logo and High-Definition Multimedia Interface are registered trademarks or trademarks of HDMI licensing, LLC.